When Brett Pitman stepped up to the penalty spot against Rochdale, there was only going to be one outcome. 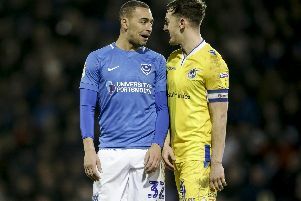 After Nathan Thompson was hacked down in the area, it gifted Pompey a golden chance to double their lead. Pitman grabbed the ball to take the spot-kick and duly obliged. The skipper waited for Josh Lillis to move before sending the keeper the wrong way and tucked home into the bottom corner. Since his arrival from Ipswich Town in July 2017, Pitman has displayed his quality from the penalty spot time and time again. He’s taken 10 in total during his Blues career, missing just one, and boasts a conversion rate of 90 per cent. With the hosts a goal behind, Nicke Kabamba was brought down by Walsall keeper Mark Gillespie. Pitman stepped up to fire home a 71st-minute equaliser in front of the Milton End. Pitman was the maker and the taker at New Meadow. He was pushed to ground by Dons skipper Barry Fuller, before sending keeper George Long the wrong way seven minutes before half-time. A Josh Magennis own goal gave the visitors the lead at the Valley. Pitman had an opportunity to double Pompey’s advantage in the 65th minute when he was held back by Christ Solly. The forward went to Ben Amos’ left but the Charlton keeper made a fine stop to push the effort around the post. Despite his previous miss, Pitman didn’t shy away from responsibilities against Wimbledon at Fratton Park 17 days later. The spot-kick came almost exactly like it did in the reverse fixture, with the skipper being nudged over by Fuller. The outcome from the set-piece was also the same. Pitman converted at the Fratton End and sealed Pompey all three points. There was a crackling atmosphere inside Fratton Park for Paul Cook’s return after leaving Pompey for Wigan the previous summer. Pitman broke the deadlock in 40th minute in front of the Fratton End, sending visiting keeper Christian Walton the wrong way. Ben Close won the spot-kick after being felled by Dan Burn. The Blues were on course for their first defeat of the season against the Shrews. However, Thompson was tripped inside the box late on, with Pitman tucking home to rescue a point. With the game locked at 1-1, Ronan Curtis was bundled over in the area shortly into the second period. Fleetwood keeper Alex Cairns guessed the right way but Pitman emphatically found the top corner. The visitors were gifted a spot-kick at the Bescot Stadium when Thompson was shoved over by Morgan Ferrier. Pitman drilled his shot into the bottom right-hand corner to set Pompey on the road to a first away victory of the year in League One. Pitman stepped up second in the penalty of the shootout in the Checkatrade Trophy final at Wembley, after Gareth Evans netted with the first. Sunderland keeper Jon McLaughlin dived the right way but got nowhere near Pitman's effort. Thompson was crudely taken out by Ethan Ebanks-Landell, with Pitman firing home in first-half stoppage time.